Uncle Pen fiddle run on it - did you know what song that was? Jimmy Martin: I believe that Jim Eanes had a song out bout old fiddlers..
had that run on it. Jim Moss: Did that come after "Uncle Pen" or before? Jimmy Martin: No! Me and Bill would ride along and write lyrics to the song. Then when we rehearsed it, I asked him to let me put that run in there. Jim Moss: The guitar run.. but what about the fiddle break? that to Bill Monroe. That is Red Taylor... ain't nobody fiddles like that. Jim Moss: That guitar run is your famous..
and slide that run in there. Now that is called the Jimmy Martin run. Jim Moss: That's right! That's ah..
Jimmy Martin: You can put it in your web site just like that. Jim Moss: I will too. You are sorta like the Jerry Lee Lewis of Bluegrass. Milwaukee famous is made a loser out of me". quiet to get those real high notes on "I Hear A Sweet Voice Calling" ? from heaven on high. I helped him write that too. never had too many people who could sing that with him either. Jim Moss: That is one of the greatest songs in Bluegrass..
Jimmy Martin, number two Lester Flatt. I think Edd Mayfield did pretty good. Jim Moss: He was great! That 1954 band was something. bass runs in his rhythm guitar playing. Jimmy Martin: Edd Mayfield come with him after I was with him (Bill Monroe). though. Had about ah $85 dollar Gibson. a picture of a kid on the cover, singing. Is that you? Jim Moss: Boy you look like you were trouble, I'll tell you. Jimmy Martin: I was 12 years old with a Gene Autry guitar. You know what? right on me standin there! "20 20 Vision" both ways. Jimmy Martin: That's what they said. That is why they put me on there. Jim Moss: It was cool! Jimmy Martin: You like what I done about him huh? Jim Moss: Yeah, I thought it was excellent! record for RCA Victor's Country Music. Jim Moss: I thought you did it with JD Crowe and ..
Jimmy Martin: I did, but I did it with the Osbornes first! Jim Moss: So, how did that go.. How did..
Jimmy Martin: I just got through a telling you son! Jim Moss: No, no.. How did you meet those guys..? The Osborne Bros.
Jimmy Martin: Well, Hell Fire, Bob come to my show when I was with Bill. Bill Monroe. That is where Sonny come up and got my autograph. Jim Moss: How did you meet Frank Wakefield? around there then. When I was in Detroit he played in a club up there. folded up and went over to see you across the street. Jimmy Martin: Loud! We only had one microphone. Everybody had to be heard. "Blue Moon of Kentucky" in A. OK? it up in B natural. So his solos was in A. Bill's was. FOLLOW ME?! and singing "Blue Moon of Kentucky" in A?" "I am just gonna move it up in B". So there is where the high lonesome sound come from. A, he recorded it in A. FOLLOW ME? Kentucky" up in B. So there's were he sung it till he died! was one of the hottest bands in Bluegrass. Jimmy Martin: Oh yeah.. We were popular. You guys were getting this tension in the music. puttin the tension in there. Jim Moss: It's like Pre-Rock and Roll, Rock and Roll. music. Added showmanship.. and good entertainment. The others..
when he was with him. Jimmy Martin: Put it like that! with him and playing the guitar with his mandolin. And that is what he said! He would be jumping up and down and everything. Jim Moss: Now when you met JD Crowe..
laughing at the microphone. Olulayyyyyeeeeee heeeee, he he he heeeee. They don't know it... I've not been given no credit on nothing! Jim Moss: Well, I will.. I think you are terrific. Jimmy Martin: Yeah, King of Bluegrass! I will play you that Tom T. Hall song..
that Tom T. Hall wrote about me.. and Gary Brewer recorded it. Ya want to hear it? Jimmy Martin: Tom T. Hall wrote this, this winter..
You heard "Bill Monroe for breakfast.." ain't ya? 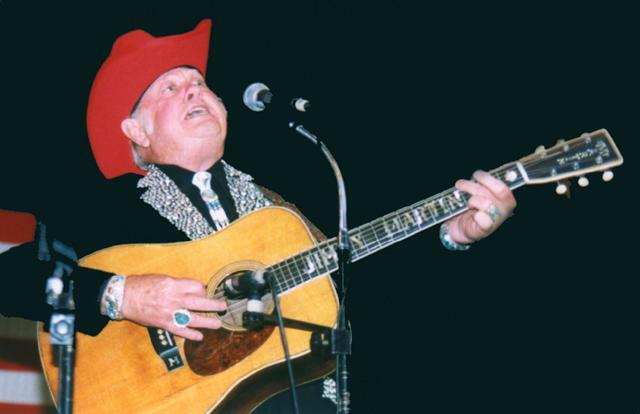 Jim Moss: Bill Monroe for breakfast? Jimmy Martin: Have you hear that by Tom T. Hall? Monroe learned off of everyone else.. didn't he! You think I told him the truth? Jim Moss: Ah well, you just told me the same thing here too. me right now on that record it sounds more like my group use to sound. Jim Moss: Well, the banjo doesn't sound like Crowe. Sounds more like Scruggs..
Jimmy Martin: Well Crowe is as close to Scruggs as you will get! Jim Moss: Well, Crowe is Crowe. but I don't listen to any modern bands though.. If it was recorded later than 1957 or 1963 I probably haven't heard of it. band was the one with Crowe. Jimmy Martin: Yeah... Well I worked on Crowe harder. We rehearsed! good music at all! Am I hitting the nail on the head? Jim Moss: Well.. that is not the way I am.. but..
just play every dam way, I am a telling you. Jimmy Martin: It ain't what we think! I am just telling you the plain dam truth! Jimmy Martin: Now what does that tell you? Jim Moss: They must not be listening. Jimmy Martin: They're not though! Jimmy Martin: We might as well stop talking about this, cause it will upset me..
the saddle, that it was about to come right off the guitar. knows what he is doing.. I think. Jimmy Martin: No.. it's just old. Jim Moss: I see. What year is that? Jimmy Martin: ahh forty five. I got a forty five and a forty three. play hard.. That the guitar looked like it was going to explode at any point. Jim Moss: So, where did you get that guitar from? What's the story on that? drinking and when he got home he cap'ed it over her head. Jimmy Martin: and I gave him $75 for it. Jim Moss: He put it over her head? all to pieces.. I had it fixed back up. Jim Moss: Well, did he continue to play after that? Jimmy Martin: Yeah. He just ended up getting him another woman. Jim Moss: Right, I guess that would be the thing to do..
What was it like playing back in the 1950's? Did you guys play radio shows a lot? Jim Moss: Did you play theaters and..
Jimmy Martin: Yeah.. percentage dates. Jim Moss: So ahh, it must have been kinda tough ah? Roanoke. That was when you started calling it "Bluegrass Music". Jim Moss: That was when it happened? it something, Hillbilly was big, "Texas Swing" was big.. ya see what I am saying? Had to separate the style of banjo and fiddle away from it.